I don’t know why I’ve chosen the weirdest pair of shoes, but I’m going to tell you about them. I have a pair of shoes that I got in this small town in Italy. And I picked them up when I was visiting a friend who was living there at the time. I remember we were walking around the town and I was like, “let’s go buy shoes” because that is something you do in Italy. 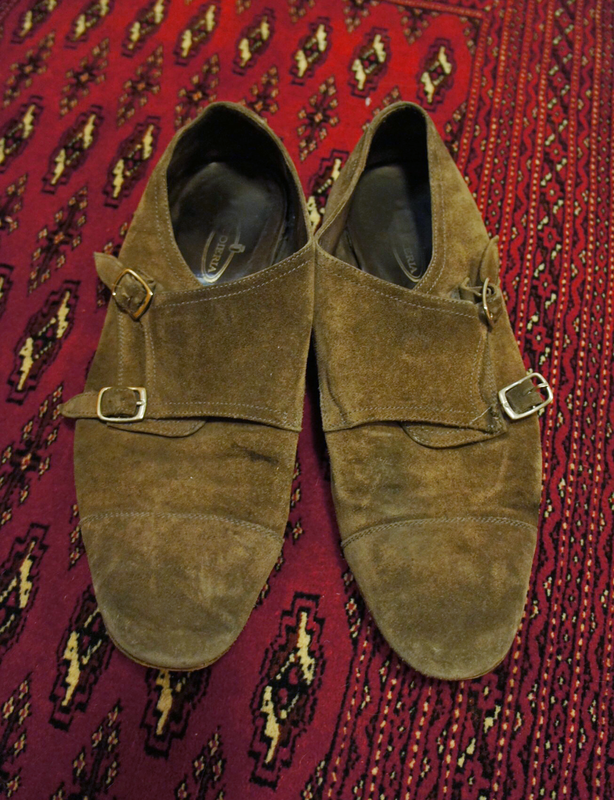 They were 40 euros, really cheap, made of leather and suede — and the style is called monk strap shoes. When I’m wearing them the inside is slick, and they are loose and very comfortable. I’ve always enjoyed wearing them on nice days or when the weather is cool ... or when I go dancing. They're fantastic dancing shoes. And the reason that they evoke these amazing memories is simply because I was with one of my favorite people on earth when I bought them, and now every single time I put them on I remember her. And I remember all of the amazing people that I’ve met in them — or that I have hung out with in them — because of the fact that they’re these fun “let’s go out and go dancing” shoes. So every single time I wear them they just remind me of that comfort. And of the fun experiences with friends and people that I really care about. That said, they are dying. I’ve had them resoled three times. Every single time I bring them in, I ask the guy who resoles them, “Can I … Can I get the heel redone again?” and he’s always like “Umm … If you want to?” ... He’s judging me for trying to repair shoes like that. And I get it, I get it, they’re cheap shoes. But they hold these memories for me that I feel really good about. They’ve also recently taken an amputation, if I can say that. The monk strap is supposed to be two buckles, and two parts that go into the buckles, and somehow magically one of those has ripped off. But you know what? I still wear them. I think these might even be a metaphor for friendships. How you go through hard times and weird experiences, and maybe you’ll do something absolutely insane. And even if it’s a bad thing and maybe your friendship is never quite the same; you’ll still always have that base experience of joy, and happiness, and goodness that you can always think back on and remember. They’re not the same, but they’re the reason that I have them in the first place. And would I go out and buy shoes that are busted? No. But I have so much of a history with them now. They’re a part of my relationships now I guess, and they reflect a lot about that.